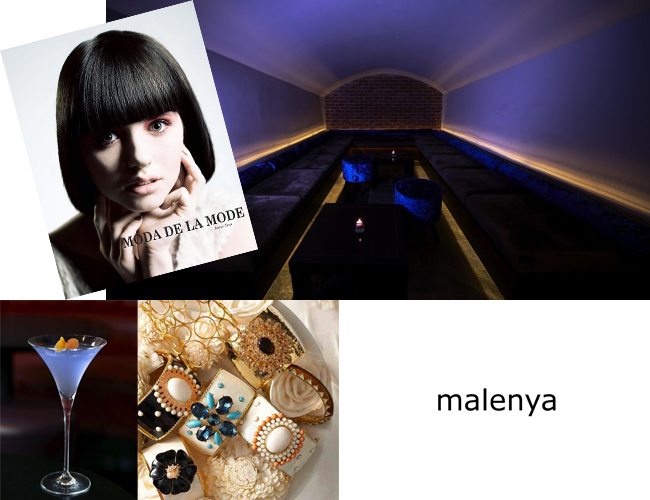 Join us this evening at the iconic Zenna luxury cocktail bar in Soho for the Moda De La Mode magazine and Stella & Dot party from 7pm-1am. 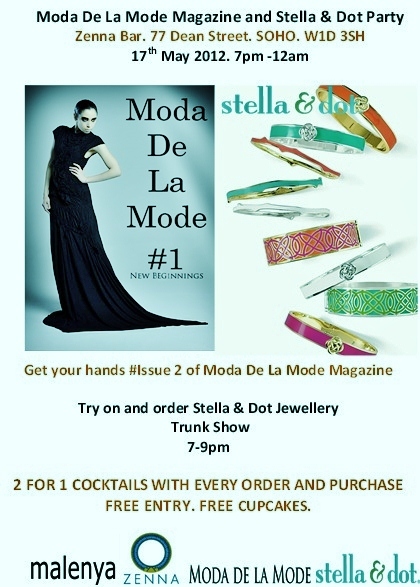 You will have the chance to get your hands on #Issue 2 of Moda De La Mode magazine, a Stella & Dot UK founding stylist will be hosting a jewellery trunk show between 7-9pm with the opportunity for you to order pieces. FREE ENTRY, FREE CUPCAKES* for all and ‘2 FOR 1’ COCKTAILS with every order of Stella & Dot AND with every purchase of Moda De La Mode. The fantastic DJs will be spinning everything from house, R&B, from the 80s, 90s and contemporary tracks. Stella & Dot is a boutique-style jewellery and accessories line, designed in New York, and available exclusively through trunk shows by independent stylists and on-line. Featured in Vogue, Elle, Glamour, New York Times, Instyle to the wrists and necklines of the most fashionable celebrities including Katy Perry and Fergie, Stella & Dot is taking the fashion world by storm. One of Stella & Dot U.K founding stylists and leader, Betsy Cook-Speer will be showcasing her pieces with a chance for you all to try on and order the hottest on-trend jewellery either for yourself, or as a gift for a loved one between 7-9pm. Don’t forget the ‘2 FOR 1’ COCKTAILS WITH EVERY ORDER. Zenna Bar has had her doors open for just over a year to critical acclaim, a listing on World’s Best Bars, winning cocktail of the year 2011 and a 5* user rating on View London. The cocktail gem, underneath the Red Fort restaurant brings a very refreshing take on the otherwise very predictable cocktail scene. Zenna’s cocktail menu features alcoholic Lassis, chocolate orange and chai tea martinis, an injection of spices such as cardamom, chilli and saffron to give a delicious twist to popular beloved cocktails. The drinks menu is reasonably priced at £6-£15 with a nibbles menu served until 11P.M. Make sure you try the star of the menu and dubbed the world’s spiciest cocktail the Illiana. If you missed out on attending the Moda de la Mode magazine launch party, this is the perfect opportunity to meet us and pick up a copy of issue 2.